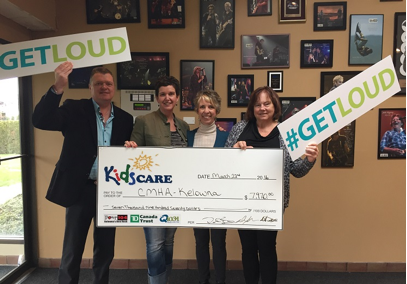 Kelowna, March 22, 2016 – Okanagan Kids Care has committed $7,970 towards #GETLOUD Toolkits for every middle and high school in School District 23, with a goal to see at least 5000 students pledge to #GETLOUD for mental health. One of the biggest barriers faced by youth living with mental health issues is the stigma or shame that comes from silence and misunderstanding. The Canadian Mental Health Association, Kelowna and District Branch, launched the #GETLOUD Pledge for schools in November 2015. “The #GETLOUD Pledge is an initiative where individuals make the commitment to talk openly about mental health, show empathy and support, and share the pledge with friends and family, all to help break the silence that keeps many people from getting the help they need,” says Candace Giesbrecht, Director of Community Engagement at CMHA Kelowna. “We are proud to support CMHA Kelowna’s work with students. Supporting change at the school level is an important step in fostering a mentally healthy environment. The #GETLOUD toolkits will encourage students to develop supportive relationships, promote mental wellness, and get help early should problems arise,” says Julie Hill, Kids Care Board Member. For more information about the Canadian Mental Health Association, email Kelowna@cmha.bc.ca or call 250.861.3644.